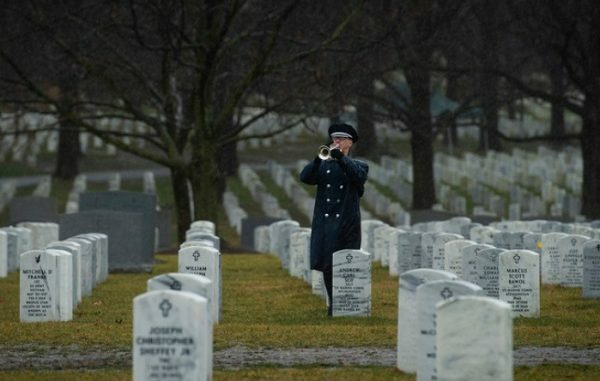 Military funeral honors were held for Staff Sergeant Dylan Elchin, an Airman assigned to the 26th Special Tactics Squadron, at Arlington National Cemetery, Virginia, on Thursday, January 24, 2019. Elchin was a Special Tactics Combat Controller who was killed in action when the vehicle he was riding in hit an improvised explosive device (IED) in Ghazni province, Afghanistan on November 27, 2018. He was deployed in support of Operation Freedom’s Sentinel. Elchin deployed to Afghanistan in August 2018 and was embedded with an Army Green Beret team. His role was to advise the Ground Force Commander, direct close air support aircraft, and deliver destructive ordnance on enemy targets in support of offensive combat operations. The 26th STS is part of the 720th Special Tactics Group, 24th Special Operations Wing of the U.S. Air Force. As a Special Tactics combat controller, Elchin was specially trained and equipped for immediate deployment into combat operations to conduct global access, precision strike, and personnel recovery operations. He was skilled in reconnaissance operations, air traffic control and terminal attack control operations. Two Special Forces Soldiers – Captain Andrew Ross and SFC Eric Emond of the 3rd SFGA died in the incident. In addition, Army Sergeant Jason McClary died later at Landstuhl Regional Medical Center in Germany as a result of injuries sustained from the IED. A number of senior members of the Air Force and special operations community attended the ceremony. The Air Force Chief of Staff General David Goldfein, USSOCOM commander General Tony Thomas, AFSOC commander LTG Brad Webb, and Chief Master Sgt. of the Air Force Kaleth O. Wright were present. Air Force Lieutenant Col. Gregory Walsh, 26th STS commander, in a letter addressed to Dylan’s teammates. Webb presented Elchin’s next of kin with a flag folded by the casket team. “Til Valhalla: Special Tactics combat controller laid to rest at Arlington National Cemetery”, U.S. Air Force, January 25, 2019. Twelve photos of the ceremony are available for viewing. Video – This three minute long video provides highlights of the ceremony at Arlington National Cemetery for Staff Sgt. Elchin. (DVIDS, Jan 24, 2019).